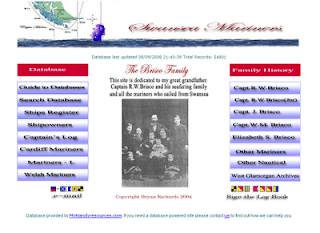 Bryan Richards has developed The Mariners from Swansea website in honor of his great grandfather, Captain R. W. Brisco. The Mariners from Swansea website provides search able databases for those researching their Welsh ancestors that were in the military and/org seafarers. The database is designed to allow one to search on the Mariner's name without having to know the name of the ship. When there no information available, a hyphen appears in the database field. The information can also be searched by the ship name, and ship owners if this information is known. This website is free to research in and is user friendly. If you would like to research this site click Mariners on Swansea Register Ships. Have fun!